Langkawi’s relatively undeveloped Tanjung Rhu area has a stretch of sandy shoreline perfect for travellers seeking some quiet patch of seaside to call their own. 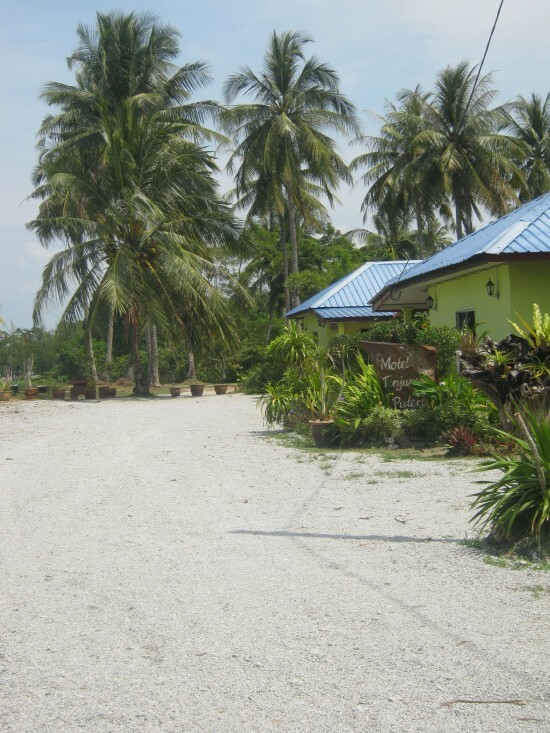 Although the majority of accommodation in this area tends to be in the four or five star category, Tanjung Puteri Motel, sitting on a headland overlooking a secluded stretch of beach should keep budget travellers happy. Ad Book now! Rates from US$28++. Average rating 7.4 from 266 reviews. Just a stone’s throw away from the sea. This quaint landscaped motel has 13 seafront rooms that are well equipped with WiFi, Astro TV, air-con and ensuite bathrooms with hot-water showers. The spacious rooms also come with verandas that face a courtyard and open to the northerly sea breeze. Starting at 80 ringgit a night for a standard king up to a 140 ringgit a night for a family room, this place is a steal. Clean and efficient rooms are a plus. 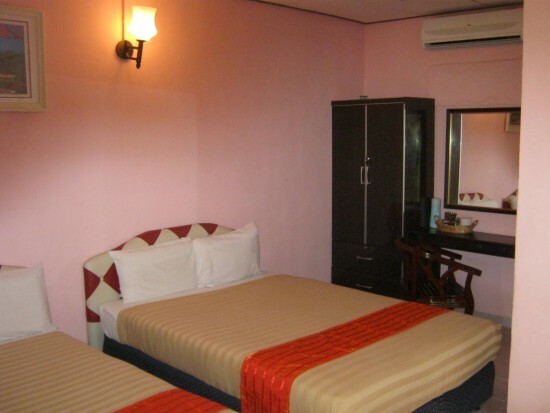 Tanjung Puteri Motel also offers a camping area to the more adventurous. 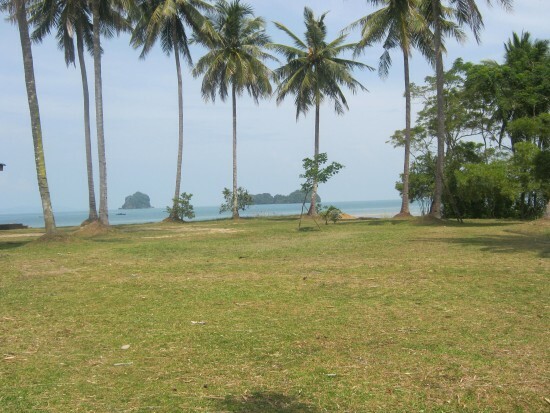 The campground is in a park-like setting under towering palms and overlooks the Andaman Sea. Although there’s only a very basic communal shower and (squat) toilet area for campers, they are clean and airy. 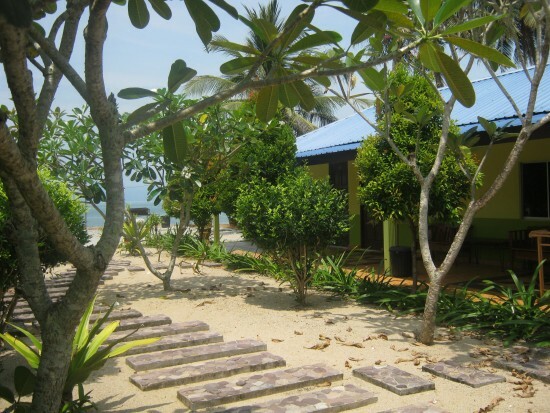 And at 20 ringgit a night for a beachfront location, who’s complaining? The perfect place to camp and ponder. 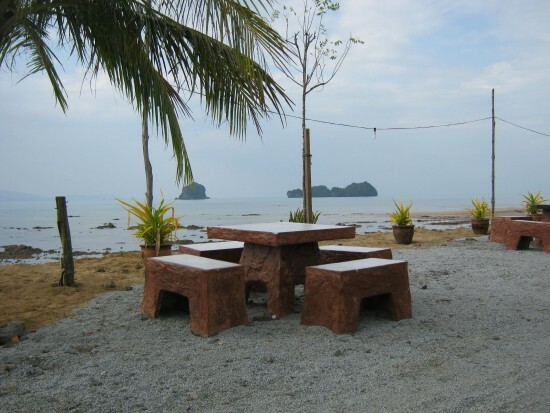 The cooking area for campers features an outdoor barbecue and a rustic beach pavilion with a lengthy countertop that serves as an outdoor common area for dining. There are however local restaurants within walking distance (about 10 minutes) and in the centre of the nearby village (20 minutes), along with a sizeable Chinese market that discreetly sells cold beer. Can’t get much more waterfront than this. The Friday night market, at the nearby village of Padang Lalang and just off the central roundabout, is where you can purchase fresh fruits and vegetables or eat your way through the many stalls of local cuisine. 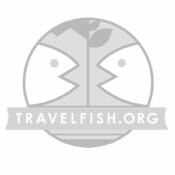 Unless you are an intrepid hiker or biker, motorbike or car hire is a necessity as the location is well off the main road and being on the more remote north side of the island taxis are infrequent and expensive. They have dibs on best budget locale in the neighborhood! The motel is a bit difficult to locate. Take the east road (Jalan Teluk Yu) out of the Padang Lalang roundabout (at the village in the centre of the north side of the island). Look for the Tanjung Puteri sign on the right. If you hit Black Sand Beach you have gone a wee bit too far. Go right until you come to the walled in police resort. Go left and then right again and travel the length of the resort wall along the beach cliffs and you will find the motel.